HF: On the evening of 3oth July 1969 the vessel San Juan arrived at Ocean Terminal. It departed 15 hours later having loaded 150 containers. This marked the first scheduled container service between Hong Kong and the US. 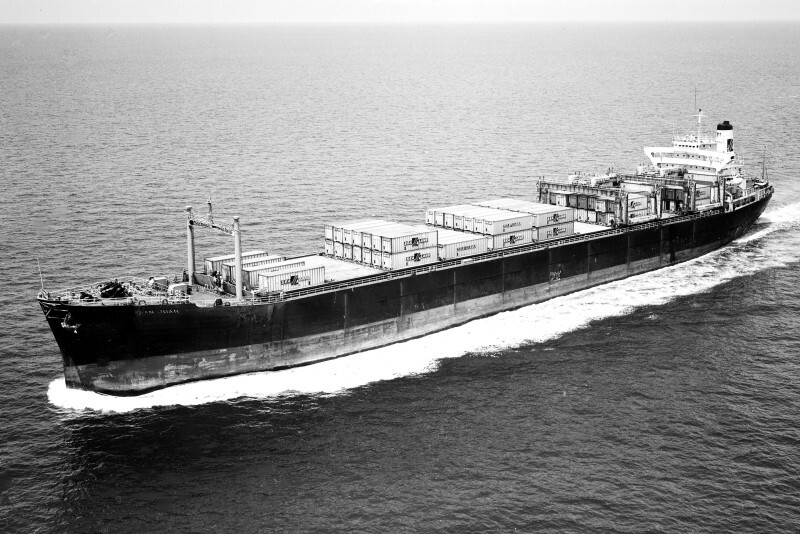 The San Juan was operated by Sea-Land and the new container service was a by-product of the company’s contract with the US government in 1967 to supply its troops fighting in Vietnam. Between 1967 and 1973 as many as 1,200 containers a month were delivered by Sea-Land to the country earning revenues from the U.S. Defense Department of about $450 million between 1967 and 1973. The containers were initially empty on the return journey to the States so the company began a service with Japan, then expanded to Hong Kong, Taiwan and South Korea. Ships carrying containers visited Hong Kong before 1969 but not on a scheduled service. See IDJ’s article linked below. Ocean Terminal had opened on 22nd March 1966. About 50 former employees recently attended an anniversary dinner at the Maritime Museum organised by Alan Goldstein, Hong Kong resident, who was Sea-Land’s chief engineer for Asia. How things have changed since the 1960s. The largest container ship today is CSCL Globe, launched this year, which can carry up to 19,000 containers And possibly has less crew than the San Juan?